Save the Date for our Fall Shopping Events! It’s barely fall, but we want to make sure you get these dates on the calendar for all your holiday shopping needs (furry legged friends need gifts, too!). We will be at the Eastlake High School Holiday Bazaar on November 3rd, and the Motley Zoo Animal Rescue Holiday Bazaar on November 17th! We will have our small batch dog treats available at both events, including our fan favorites as well as special dog treats just for the holidays. See you there! We can't wait to see you at the Issaquah Down Home 4th of July Celebration! This family celebration includes a Kids n' Pets Parade, live entertainment, free games and a fun vendor village (where you'll find Chasing Rabbits Dog Bakery!). The pet parade begins at 11:00am and the festivities run until 2:00pm. Bring your pooch by the Dog Bakery booth for a free sample of our all natural dog treats and stock up on all of your favorite Chasing Rabbits Dog Bakery dog treats! We will also have special 4th of July pupcakes for sale! Join us at the Motley Zoo Craft Bazaar and Bake Sale! Here's another chance to get an early start on your holiday shopping! Join Chasing Rabbits Dog Bakery at the Motley Zoo Craft Bazaar and Bake Sale, November 18th from 10am - 4pm in Redmond, WA. And - double whammy - you get to support a great animal rescue organization AND get access to some wonderful handcrafted gift items! We will be there with all of your favorite Chasing Rabbit Dog Bakery treats as well as some holiday themed stocking stuffers for your favorite pooch! See you there! Join us at the Eastlake High School Holiday Bazaar, November 4th! This is one of the best craft fairs on the eastside, with tons of great gift options for the upcoming holiday season. We can't wait to see you there! We'll have all of your favorites plus tons of special holiday and seasonal dog treats that make for great gifts (and stocking stuffers!). Save the date! We'll be at Snoqualmie Railroad Days, August 18-20 with a great selection of our handmade treats for sale! This annual community festival celebrates the spirit of Snoqualmie's railroad and logging past. Enjoy music, food and craft vendors, a classic car show and plenty of kids' activities! For more info, visit the Railroad Days website . Join Us at North Sound Family Fest This Saturday! Chasing Rabbits Dog Bakery will be onsite at North Sound Family Fest, presented by North Sound Macaroni Kid. We will have our most popular dog treats available for sale! This FREE event will also feature dozens of exhibitor booths and community resources offering attendees valuable information on the latest and greatest products, services, educational options and more in your own communities! Get your Holiday Treats at the Eastlake H.S. Holiday Bazaar! 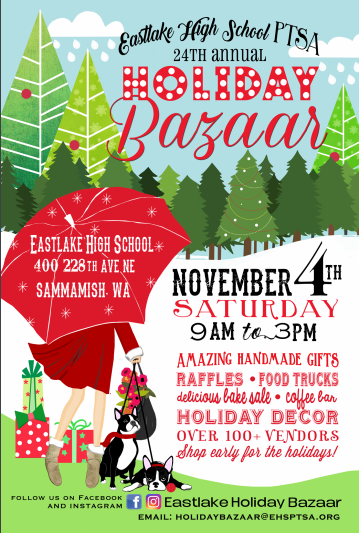 Join us Saturday, November 5th at the Eastlake High School Holiday Bazaar in Sammamish, Washington! We'll be onsite from 9:00am to 3:00pm, selling hand-crafted dog treats. We'll have special holiday inspired treats, along with some of our most favorite bagged dog biscuits! Our treats are great for gifts - for your pup, or for the dog lovers in your circle of friends and family. See you at the Eastlake Holiday Bazaar! Bring your dog for a day of fun Saturday, May 21st at Petpalooza in Auburn, Washington. Chasing Rabbits will be there! This free, family-friendly event kicks off at 9:30am with a Dog Trot 3K / 5K fun run. Petpalooza features an animal-related entertainment stage, live entertainment stage, flydog and agility demos, pony rides, agility areas, a pet parade, over 150 vendor booths, giveaways and lots of activities to keep people and pets happy and entertained! Visit the Chasing Rabbits Dog Bakery booth - Booth 96. Click here for a map of the event and full list of vendors. We'll have a great selection of dog treats for sale, including some of our special frosted treats that we only sell at events. See you at Petpalooza! For full event details, including parking info and driving directions, visit the Petpalooza website or Petpalooza Facebook page.